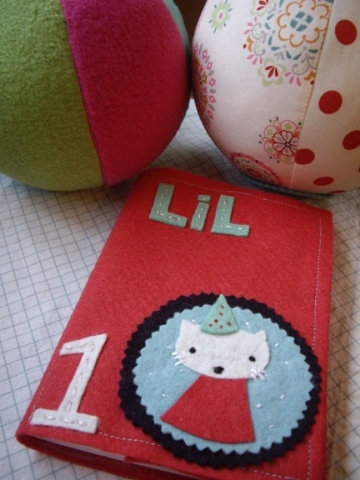 I made her some balls, a wee teddy, and a #1 photo book (inspired by Lori Joy Smith's little photo books for her daughter) and embellished with a kitty from a project by Cathy Gaubert in the book Fa La La La Felt. Cathy's projects in this book are so, so cute. You can get it as an ebook now, or wait until 2010 for an actual copy. 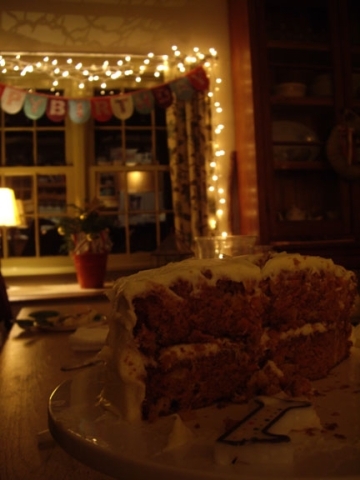 I made Ina's Carrot Cake, which was super, super moist and yummy. Lillian was not a fan. It was her very first taste of a sweet, and she puckered up and spit it out! She is definitely more of a savory girl, for sure! 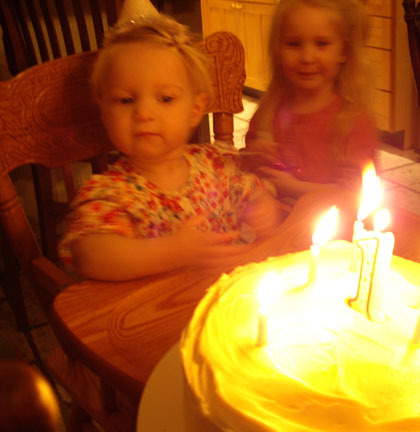 Happy Birthday to my sweet little girl! You're so, so loved by everyone, with your contagious, silly grin and your funny jibber-jabber, and your fancy dancing. This sounds like the perfect celebration. One already. Happy Birthday Lil. The gifts you made Jenn are just perfect. Oh is she one already?? That went way to fast! Happy Birthday little one!! I love her gifts:) Less is more. With my kids this Christmas I have no clue what to buy:) I want no more toys. Happy Birthday baby girl! We can’t believe you are one already! what a lovely, lovely birthday girl and celebration! and you are so so right about the simplicity of birthday parties (i think that i go overboard on the party itself, maybe; it also could be the fact that we have 3 birthdays to celebrate! )and presents. i hope that those 2 sweet girlies enjoyed the day. i cannot believe that a year has gone by already. thank you so very much for the kind words about my projects in the book! the whole thing is still a bit surreal. :) can i tell you how very special i felt when i saw your photo?? you totally made my day! oh, and um…i’ll take three of the little snowguy up there in your header. gah…you never disappoint with your creatures!!! Happy Birthday to your cutie one.. Sounds like a wonderful celebration..Happy Belated Birthday wishing to your sweet little one.